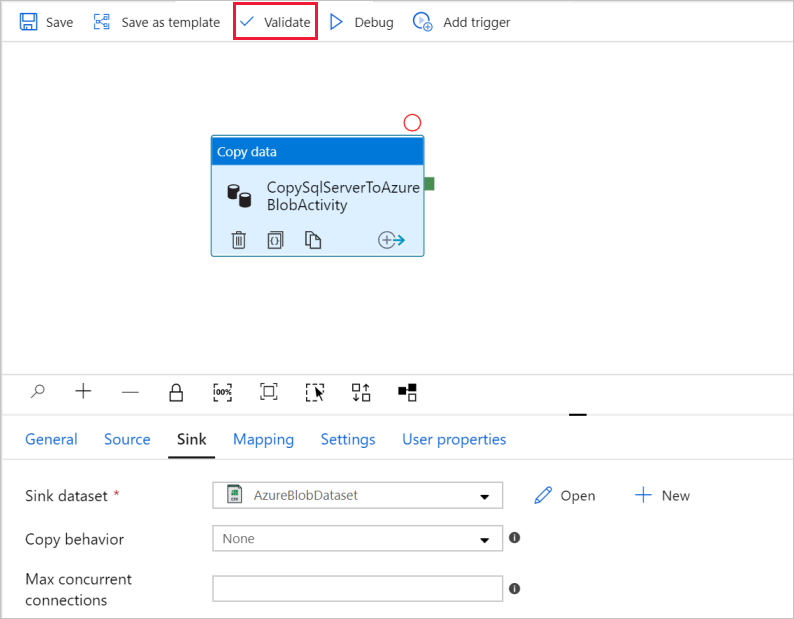 In this tutorial, you use the Azure Data Factory user interface (UI) to create a data factory pipeline that copies data from an on-premises SQL Server database to Azure Blob storage. You create and use a self-hosted integration runtime, which moves data between on-premises and cloud data stores. This article doesn't provide a detailed introduction to Data Factory. For more information, see Introduction to Data Factory. Create a self-hosted integration runtime. 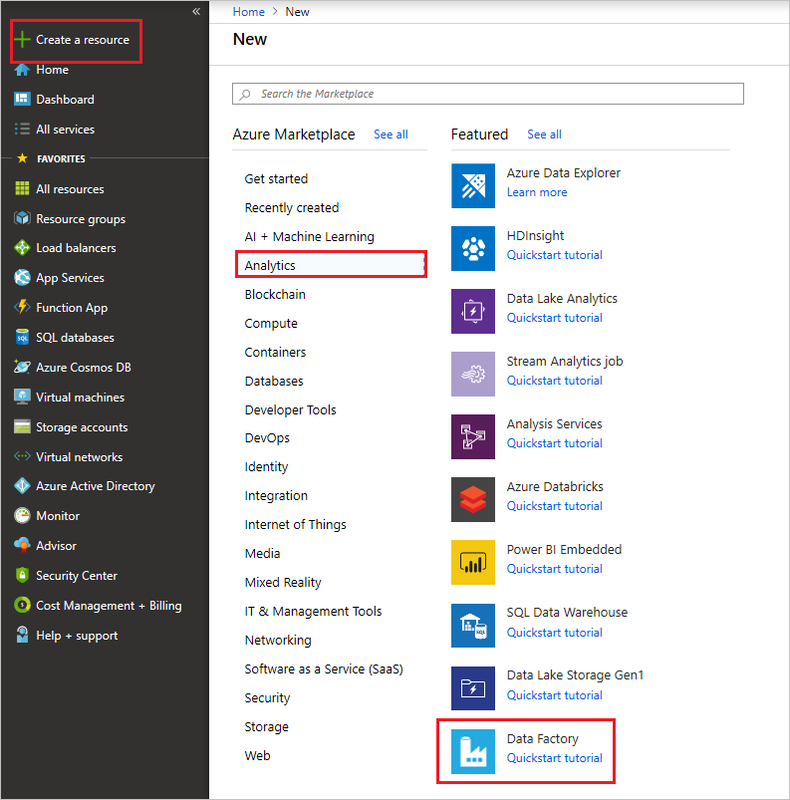 Create SQL Server and Azure Storage linked services. 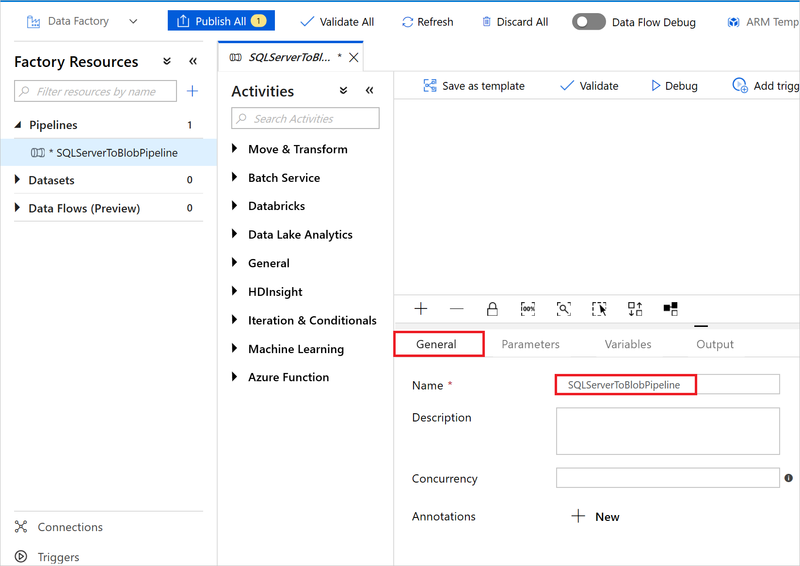 Create SQL Server and Azure Blob datasets. Create a pipeline with a copy activity to move the data. Before you begin, if you don't already have an Azure subscription, create a free account. 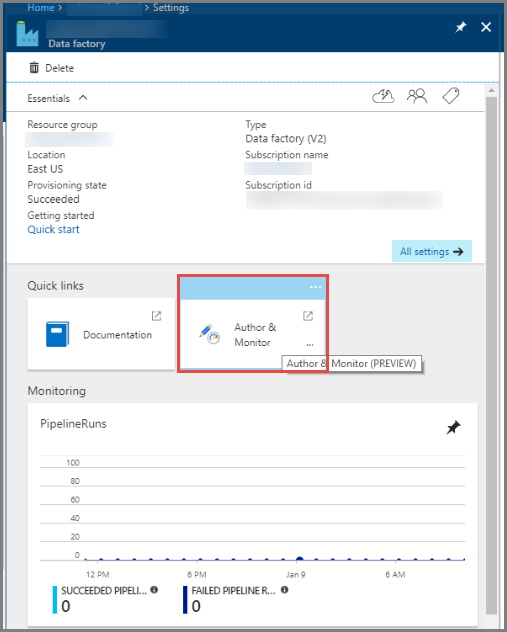 To create data factory instances, the user account you use to sign in to Azure must be assigned a Contributor or Owner role or must be an administrator of the Azure subscription. To view the permissions you have in the subscription, go to the Azure portal. In the upper-right corner, select your user name, and then select Permissions. If you have access to multiple subscriptions, select the appropriate subscription. 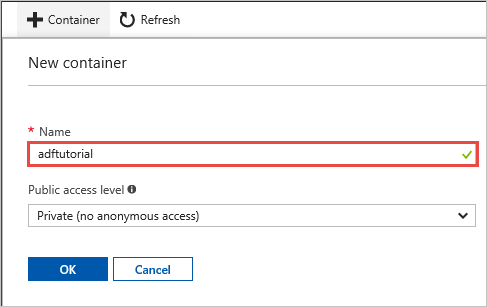 For sample instructions on how to add a user to a role, see Manage access using RBAC and the Azure portal. In this tutorial, you use an on-premises SQL Server database as a source data store. 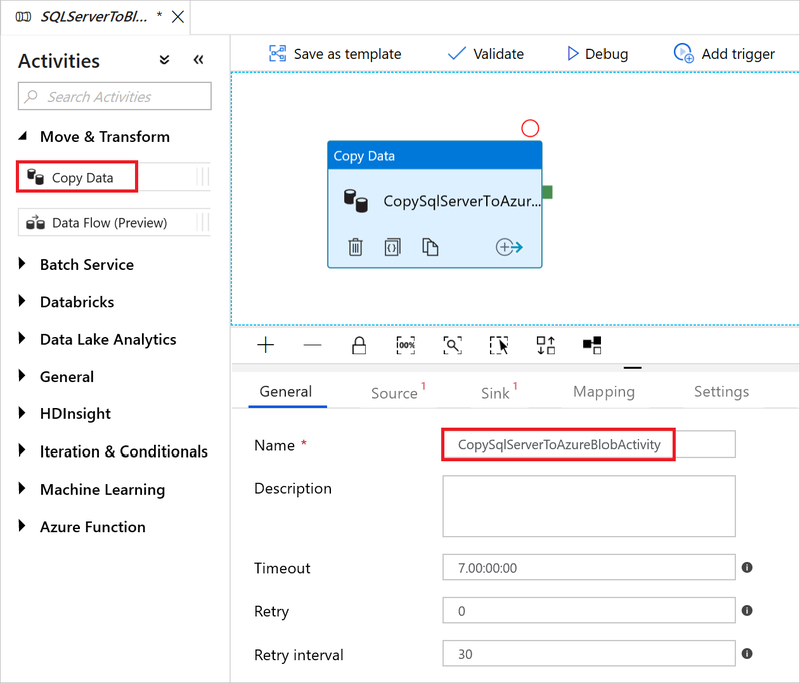 The pipeline in the data factory you create in this tutorial copies data from this on-premises SQL Server database (source) to Blob storage (sink). You then create a table named emp in your SQL Server database and insert a couple of sample entries into the table. Start SQL Server Management Studio. If it's not already installed on your machine, go to Download SQL Server Management Studio. Connect to your SQL Server instance by using your credentials. Create a sample database. In the tree view, right-click Databases, and then select New Database. In the New Database window, enter a name for the database, and then select OK. In the tree view, right-click the database that you created, and then select New Query. 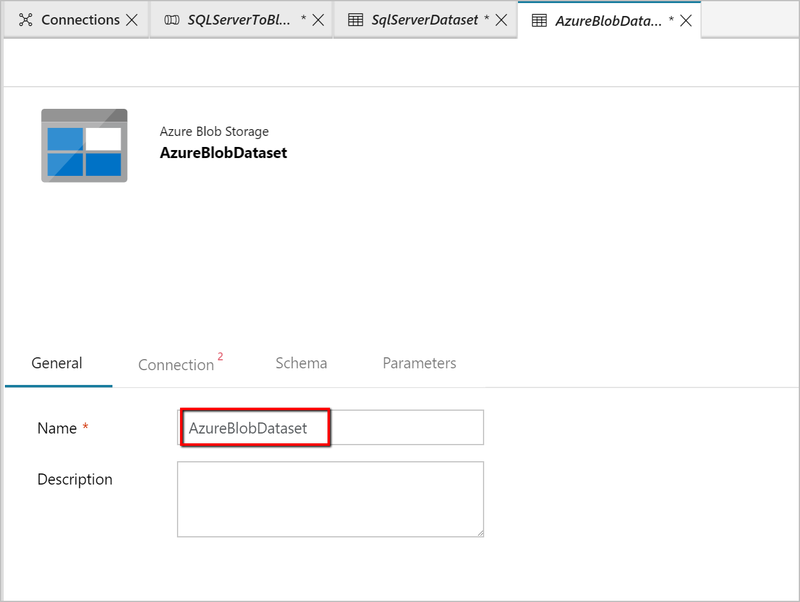 In this tutorial, you use a general-purpose Azure storage account (specifically, Blob storage) as a destination/sink data store. 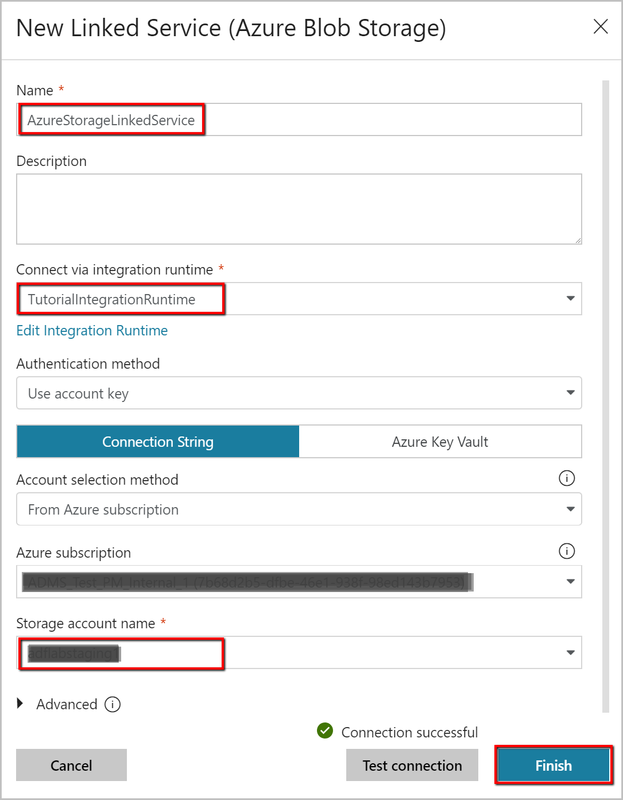 If you don't have a general-purpose Azure storage account, see Create a storage account. 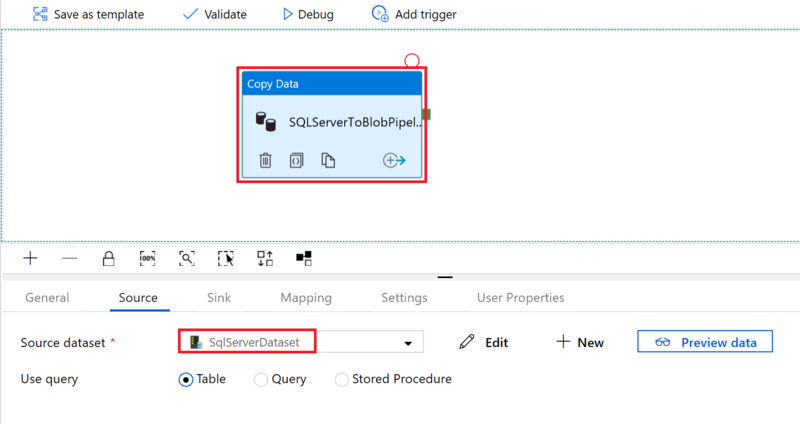 The pipeline in the data factory that you create in this tutorial copies data from the on-premises SQL Server database (source) to Blob storage (sink). Sign in to the Azure portal with your Azure user name and password. In the left pane, select More services. Filter by using the Storage keyword, and then select Storage accounts. In the list of storage accounts, filter for your storage account, if needed. Then select your storage account. In the Storage account window, select Access keys. In the Storage account name and key1 boxes, copy the values, and then paste them into Notepad or another editor for later use in the tutorial. In this section, you create a blob container named adftutorial in your Blob storage. In the Storage account window, go to Overview, and then select Blobs. In the Blob service window, select Container. In the New container window, under Name, enter adftutorial. Then select OK. In the list of containers, select adftutorial. Keep the container window for adftutorial open. You use it verify the output at the end of the tutorial. Data Factory automatically creates the output folder in this container, so you don't need to create one. Open the Microsoft Edge or Google Chrome web browser. Currently, Data Factory UI is supported only in Microsoft Edge and Google Chrome web browsers. The name of the data factory must be globally unique. If you see the following error message for the name field, change the name of the data factory (for example, yournameADFTutorialDataFactory). For naming rules for Data Factory artifacts, see Data Factory naming rules. Under Location, select the location for the data factory. Only locations that are supported are displayed in the drop-down list. 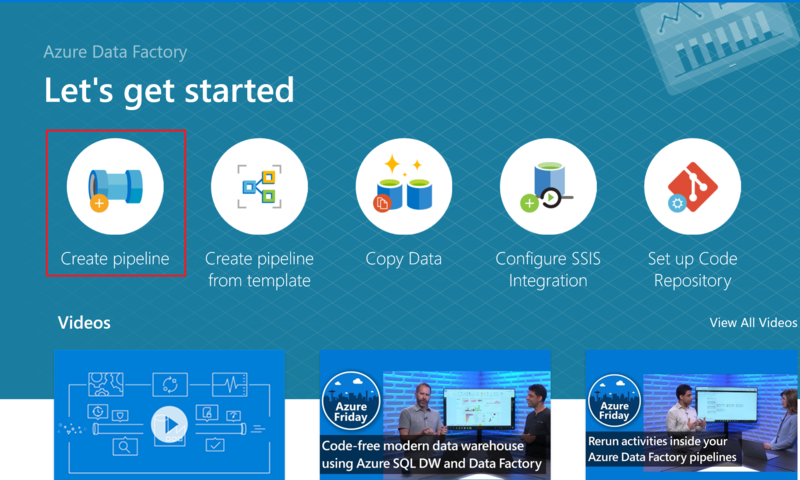 The data stores (for example, Storage and SQL Database) and computes (for example, Azure HDInsight) used by Data Factory can be in other regions. 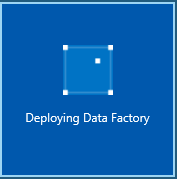 Select the Author & Monitor tile to launch the Data Factory UI in a separate tab. On the Let's get started page, select Create pipeline. A pipeline is automatically created for you. You see the pipeline in the tree view, and its editor opens. On the General tab at the bottom of the Properties window, in Name, enter SQLServerToBlobPipeline. In the Activities tool box, expand DataFlow. Drag and drop the Copy activity to the pipeline design surface. Set the name of the activity to CopySqlServerToAzureBlobActivity. In the Properties window, go to the Source tab, and select + New. In the New Dataset window, search for SQL Server. Select SQL Server, and then select Finish. You see a new tab titled SqlServerTable1. You also see the SqlServerTable1 dataset in the tree view on the left. On the General tab at the bottom of the Properties window, in Name, enter SqlServerDataset. Go to the Connection tab, and select + New. 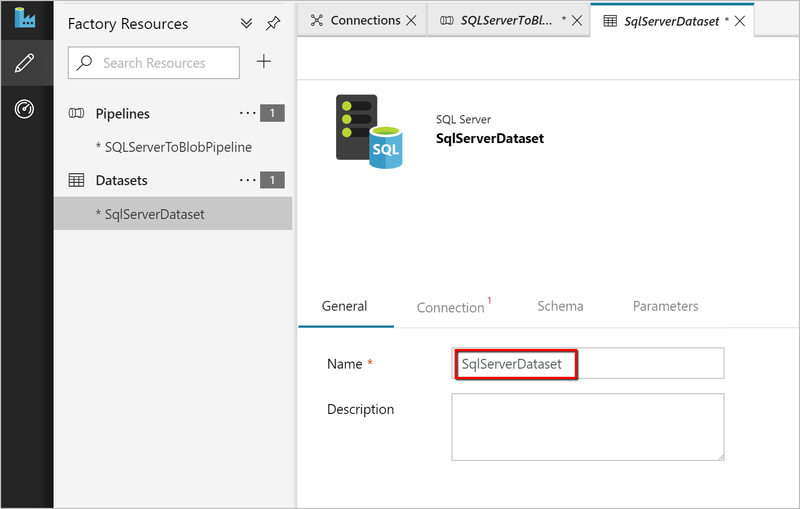 You create a connection to the source data store (SQL Server database) in this step. 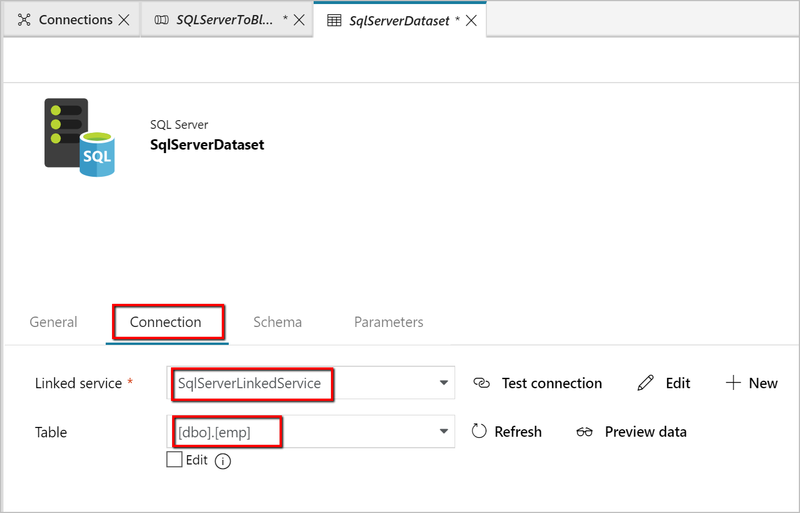 In the New Linked Service window, add Name as SqlServerLinkedService. Select New under Connect via integration runtime. 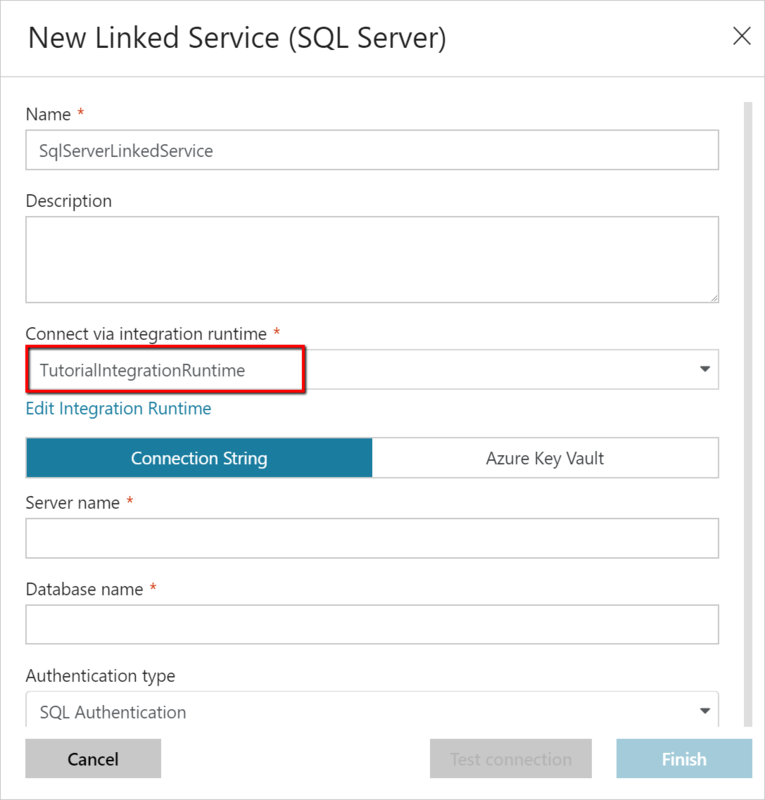 In this section, you create a self-hosted integration runtime and associate it with an on-premises machine with the SQL Server database. The self-hosted integration runtime is the component that copies data from the SQL Server database on your machine to Blob storage. 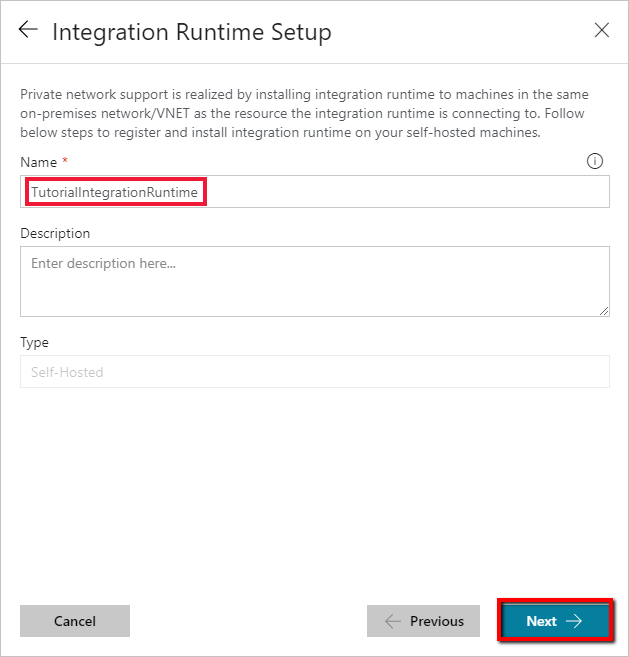 In the Integration Runtime Setup window, select Private Network, and then select Next. Enter a name for the integration runtime, and select Next. Under Option 1: Express setup, select Click here to launch the express setup for this computer. 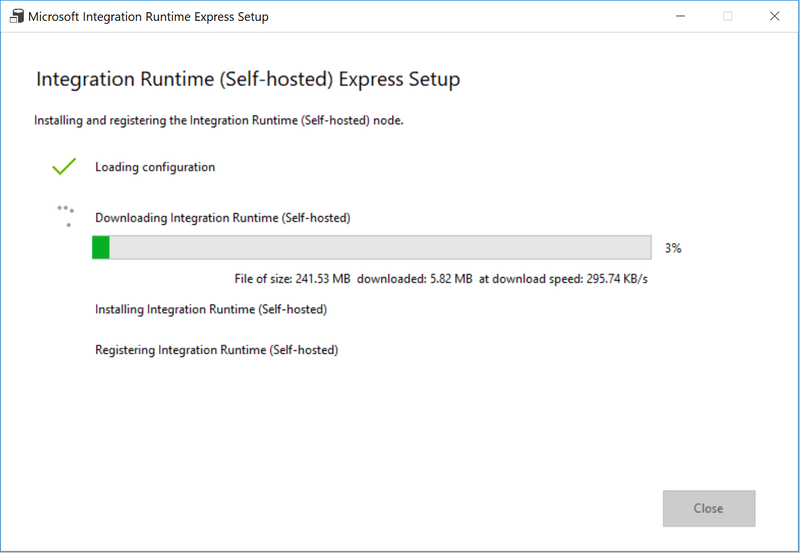 In the Integration Runtime (Self-hosted) Express Setup window, select Close. 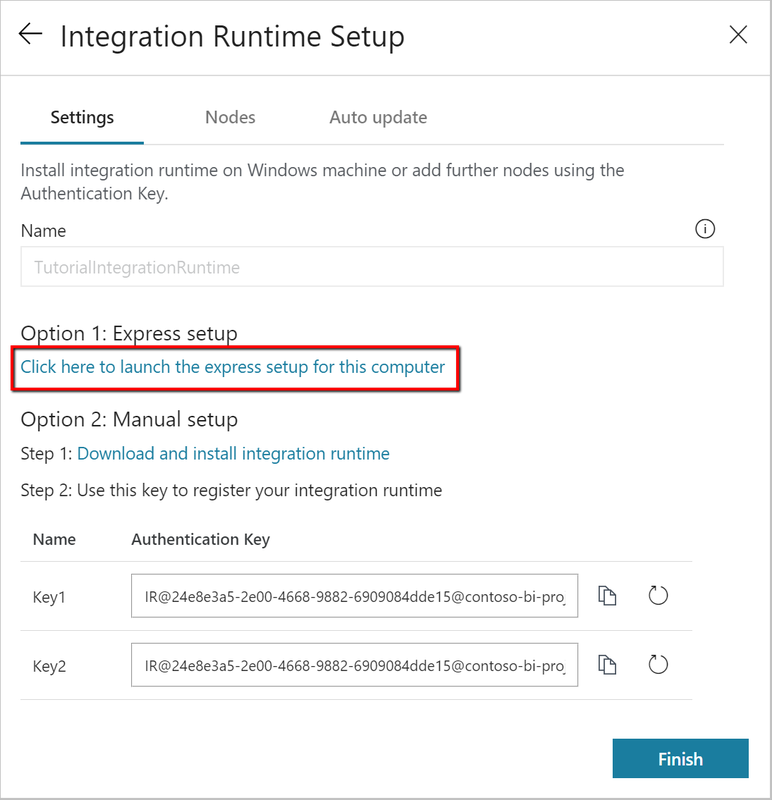 In the New Linked Service window, ensure the Integration Runtime created above is selected under Connect via integration runtime. a. Under Name, enter SqlServerLinkedService. b. Under Connect via integration runtime, confirm that the self-hosted integration runtime you created earlier shows up. c. Under Server name, enter the name of your SQL Server instance. d. Under Database name, enter the name of the database with the emp table. e. Under Authentication type, select the appropriate authentication type that Data Factory should use to connect to your SQL Server database. f. Under User name and Password, enter the user name and password. If you need to use a backslash (\) in your user account or server name, precede it with the escape character (\). For example, use mydomain\\myuser. g. Select Test connection. 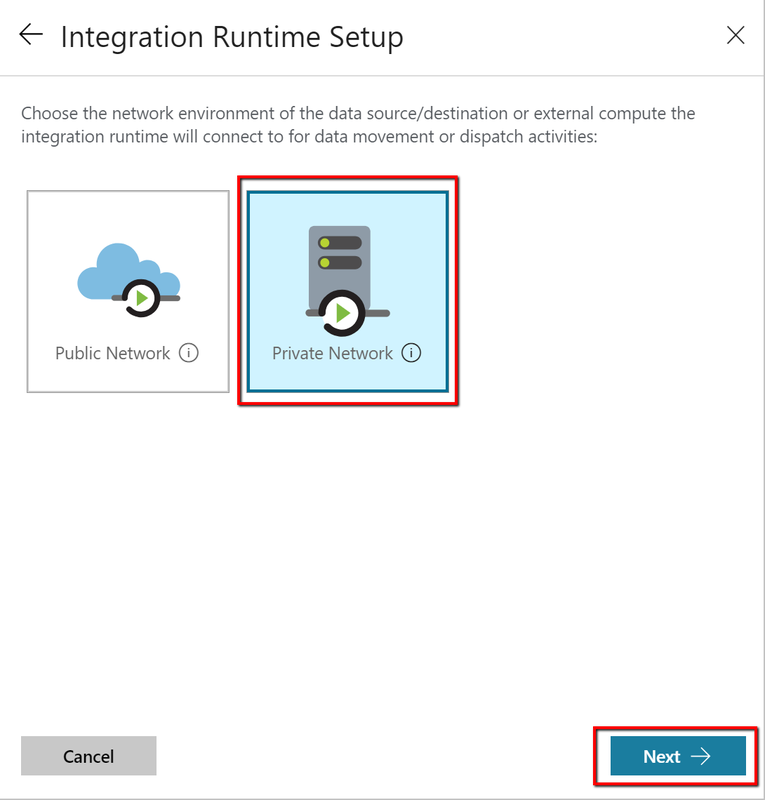 Do this step to confirm that Data Factory can connect to your SQL Server database by using the self-hosted integration runtime you created. h. To save the linked service, select Finish. a. In Linked service, confirm that you see SqlServerLinkedService. b. In Table, select [dbo].[emp]. Go to the tab with SQLServerToBlobPipeline, or select SQLServerToBlobPipeline in the tree view. Go to the Sink tab at the bottom of the Properties window, and select + New. 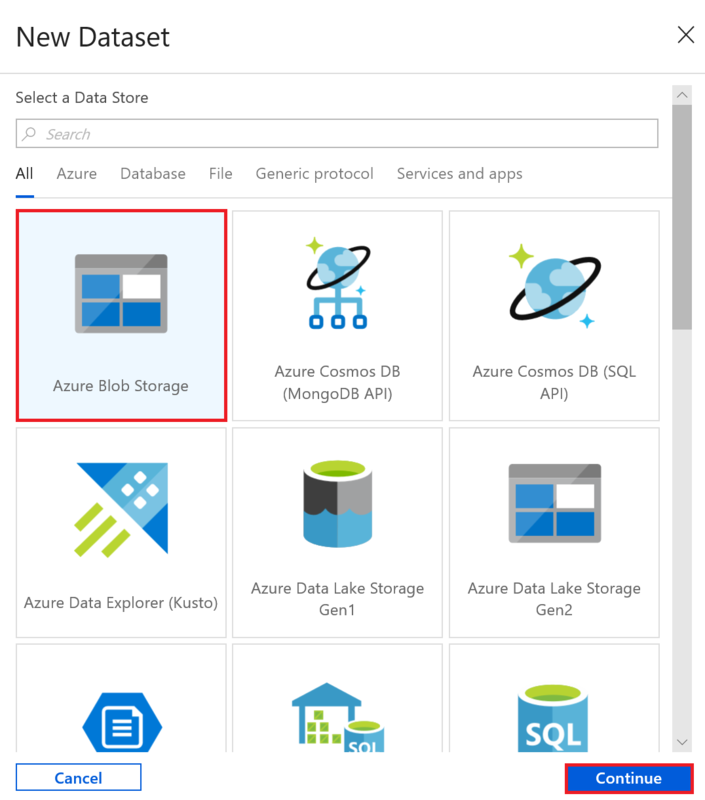 In the New Dataset window, select Azure Blob Storage. Then select Finish. You see a new tab opened for the dataset. You also see the dataset in the tree view. Go to the Connection tab at the bottom of the Properties window. Next to Linked service, select + New. a. Under Name, enter AzureStorageLinkedService. b. Under Storage account name, select your storage account. c. To test the connection to your storage account, select Test connection. a. In Linked service, confirm that AzureStorageLinkedService is selected. b. For the folder/ Directory part of File path, enter adftutorial/fromonprem. 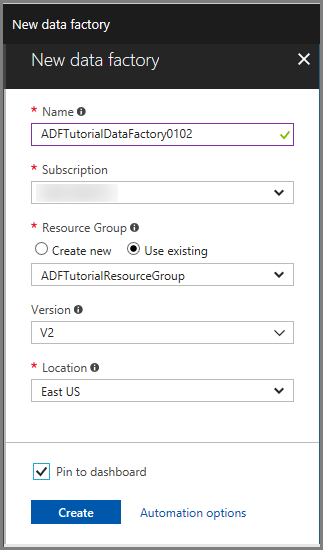 If the output folder doesn't exist in the adftutorial container, Data Factory automatically creates the output folder. c. For the file name part of File path, select Add dynamic content. d. Add @CONCAT(pipeline().RunId, '.txt'), select Finish. This will rename the file with PipelineRunID.txt. Go to the tab with the pipeline opened, or select the pipeline in the tree view. 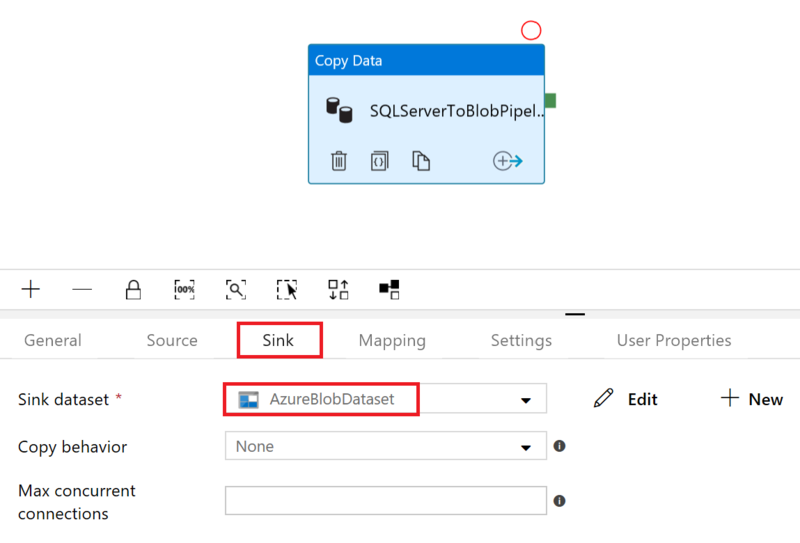 In Sink Dataset, confirm that AzureBlobDataset is selected. To validate the pipeline settings, select Validate on the toolbar for the pipeline. To close the Pipe Validation Report, select Close. 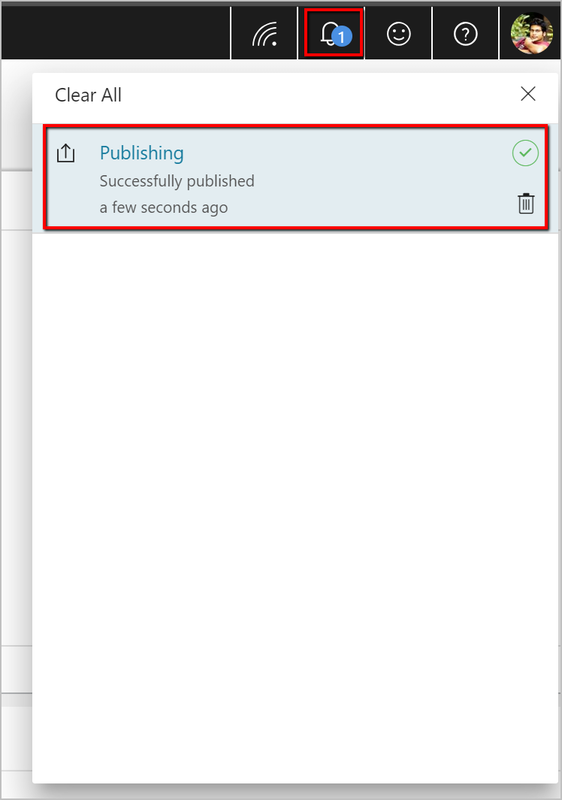 To publish entities you created to Data Factory, select Publish All. Wait until you see the Publishing succeeded pop-up. To check the status of publishing, select the Show Notifications link on the left. To close the notification window, select Close. Select Trigger on the toolbar for the pipeline, and then select Trigger Now. Go to the Monitor tab. You see the pipeline that you manually triggered in the previous step. To view activity runs associated with the pipeline run, select the View Activity Runs link in the Actions column. You see only activity runs because there is only one activity in the pipeline. To see details about the copy operation, select the Details link (eyeglasses icon) in the Actions column. To go back to the Pipeline Runs view, select Pipelines at the top. The pipeline automatically creates the output folder named fromonprem in the adftutorial blob container. 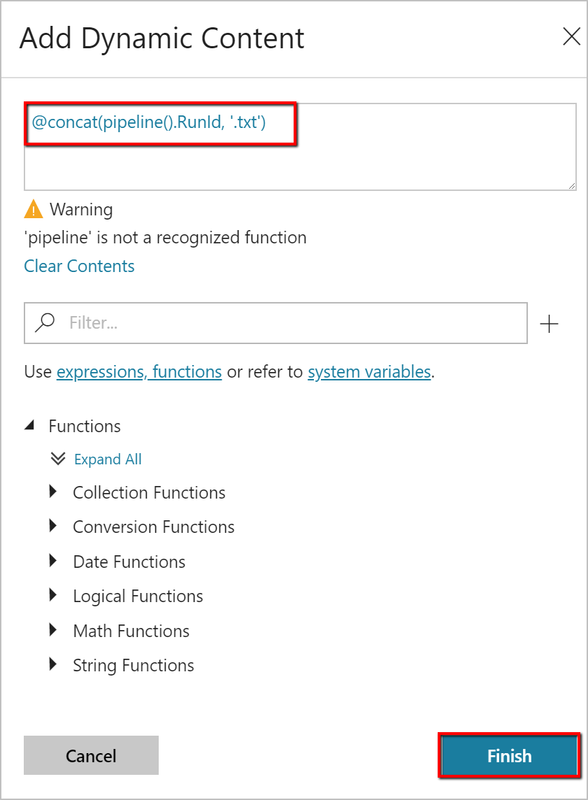 Confirm that you see the [pipeline().RunId].txt file in the output folder. 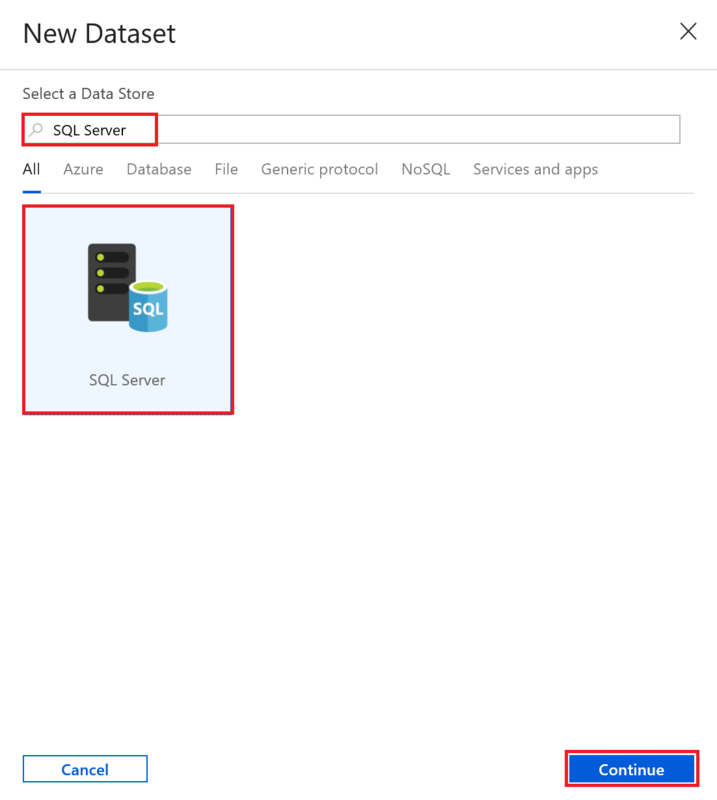 Create SQL Server and Storage linked services. Create SQL Server and Blob storage datasets. For a list of data stores that are supported by Data Factory, see Supported data stores.